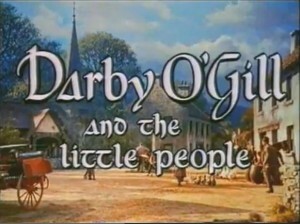 It’s well I remember the very day in 1959 that I first saw the film of Darby O’Gill and the Little People. The Ma’ and Da’ had wanted to get us kids out of the house for a few hours, God only knows why and they suggested we go up to the Park and collect chestnuts. 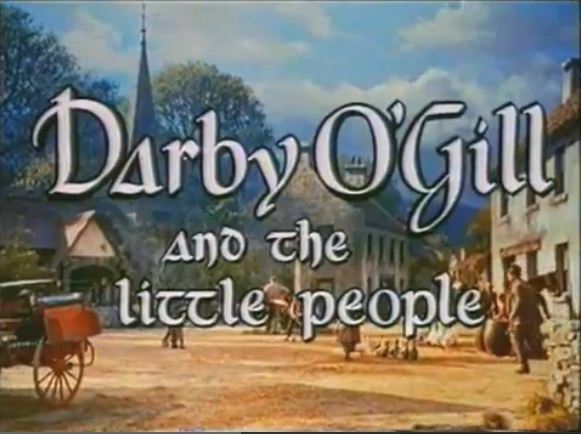 Now one of the brothers who was kind of clever at the time mentioned that Darby O’Gill was on in the State Picture House in Phibsborough. Well in next to no time the Da’ shoved his hand into his trouser pocket and it came out with a fistful of money. And before we knew it we were off to the State. I remember the Ma’ standing at the hall door waving us of down the road with a big smile on her face. We even got the bus fare but the brother made us walk so we could buy some sweets with the money. We went into Mister Reid’s shop on the Cabra Road and got a Gob Stopper each, I think we still had them in our mouths at the end of the picture. And do you know what, I remember when we had to pass the little red coloured Protestant Church near Saint Peter’s, we had to look away from the door in case we saw the Devil. Well by the time we got to the State me little legs were killing me from walking the whole length of the Cabra Road. Of course I was walking miles behind the others as usual, dawdling along as the Da’ used to say. By God the excitement was ninety when we saw the big queue all down the steps at the side of the Picture House. There must have been at least a million kids in that queue. After what seemed like an eternity we finally reached the main door into the cinema. And there was your man in his uniform ordering everyone about…‘Stay in line or you’ll be barred’… the dreaded Usher from Sgt Pepper’s Lonely Hearts Club Band. Wasn’t it great excitement all the same when you got the smell of fresh popcorn and you drooling down your chin from sucking your Gob Stopper. We all had to hold hands in the dark in case we got lost from each other. And there was the Usherette shining her torch into our faces and blinding us like little baby rabbits in the midle of a field up near the Cabra Baths. Didn’t we get our moneys worth back then all the same with two pictures, a cartoon, maybe a Folly-In-Upper and a Trailer. Do you remember the ads that came on as well. There was the Kennedys Bread song, do you remember that one? the Babycham drink in the fancy glass and the HB ice-pops. And then the big giant shell came on the screen behind the curtain that began to open up. Sure it was great entertainment altogether. Suddenly the whole cinema was lit up and you could see all the kids around you in the other seats. Do you remember if there was a cowboy film on and you’d see your man sneaking up behind the Chap. Be the jakers the whole picture house would erupt with every kid screaming and shouting ‘He’s ahind yeah mister’. The poor ould usher’d be running up and down the aisle shouting out at the poor kids to stop the noise. Well there was one scene in particular from Darby O’Gill that I’ll never forget. Do you remember when the death coach was coming for him? I think every young fella and young one in the picture house hid under their coat with fright. Well I know I did anyway and even though I didn’t see what happened next I had nightmares for a month afterwards. It was nearly as bad as being frightened by the old coat hanging on the back of our bedroom door. What an experience for a little spindley legged eight year old. It was many years later that I actually had the nerve to go and see that film again and not put my head under my coat.